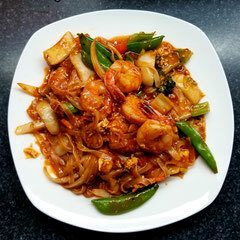 Rice noodles stir-fried with prawns, egg, broccoli, peppers, carrots, celery, snap peas and specied with fresh chillies. 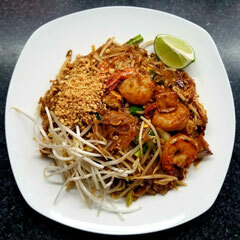 Rice noodles stir-fried with prawns, tofu, egg, green onions, bean sprouts and ground peanuts. 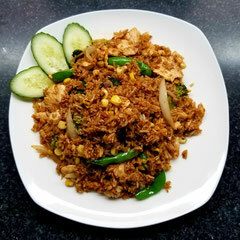 Spiced with tamarind sauce and chillies. 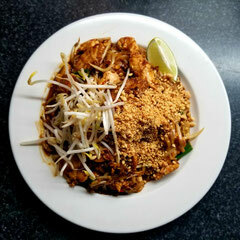 Rice noodles stir-fried with chicken, tofu, egg, green onions, bean sprouts and ground peanuts. Chicken fried rice with seasoning sauce in Thai spices with onions, broccoli, snap peas, tomatoes, egg and mixed vegetables. 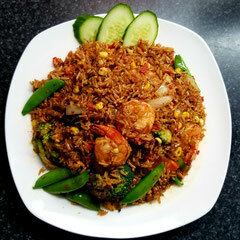 Prawns fried rice with seasoning sauce in Thai spices with onions,broccoli, snap peas, tomatoes, egg and mixed vegetables. 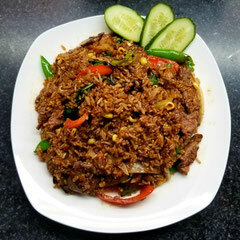 Spicy fried rice with beef, egg, peppers, onions, mushrooms and snap peas, flavoured with Thai basil and fresh chillies. easoned with sweet soy sauce. 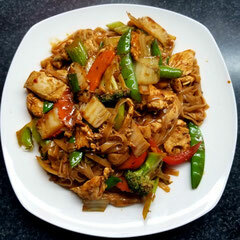 House-made tamarind sauce with chicken, tofu, egg, green onions, bean sprouts and fresh chillies. 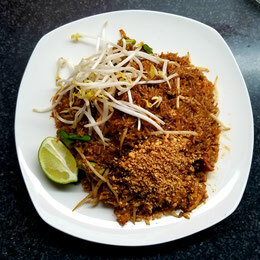 Garnished with ground peanuts and fresh lime wedges.